I know some people thought the previous version of iOS’s Music app was a little bloated, but I liked being able to listen to podcasts within it. Now it seems that I have to use Apple’s Podcasts app, which I don’t like very much. Is there any way for me to put podcasts into the new Music app? You must not attempt to download podcasts or iTunes U content from the iTunes app on your device. If you do, you’ll be told that you must have the appropriate apps installed (and that doesn’t include the Music app as far as iTunes is concerned). So, in a nutshell, remove the Podcasts and iTunes U apps from your device and sync that content only through your Mac's copy of iTunes. 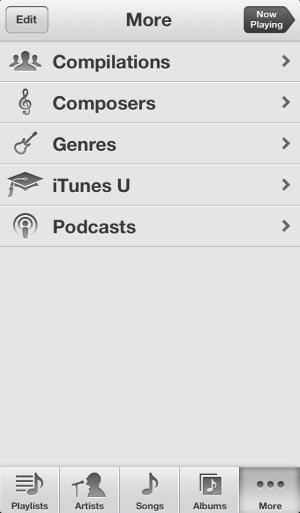 Do that and you’ll find Podcasts and iTunes U entries when you tap the More button in the Music app. The obvious disadvantage of doing things this way is that you can’t grab new podcast and iTunes U content from your iPhone while on the go (and that includes podcasts you’ve subscribed to). You must do your syncing from your computer as we did in the old days.